I am an avid fan of Warren Buffett letters, and today is my lucky day because we have a new annual letter. And it comes with not just the update for the year but for the benefit of the new shareholders (due to partial stock deal in acquiring the Rail company) – a nice introduction and summary of how Berkshire operates. I am neither a multi-million dollar investor (yet!) nor an investment guru so I read these letters for two reasons – learning how to think about your business (or business unit for some of us), and personal life lessons. 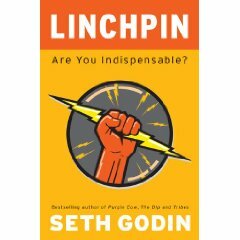 I am also reading Seth Godin’s latest amazing book Linchpin that asks a very simple question – Are you Indispensable? And while the two – Warren Buffett’s shareholder letter and Seth Godin’s book are on very different topics – I think there is a common underlying life lesson. How We Measure Our Selves: Intrinsic or Market Value? Our metrics for evaluating our managerial performance are displayed on the facing page. From the start, Charlie and I have believed in having a rational and unbending standard for measuring what we have – or have not – accomplished. That keeps us from the temptation of seeing where the arrow of performance lands and then painting the bull’s eye around it. What car you drive? This one has an obvious appeal – everyone can see it and its hard to lie about it. However, just like a stock price that barely reflects the fundamentals – the car you drive says more about the size of your ego (and I am not going there), your inability to understand depreciating versus appreciating assets, or just taste. A fabulous car that makes you feel good when you drive or pick up your date can be a good thing – but has almost nothing to do with – how much money you make or how wealthy you are or even how interesting a person you are. It actually reflects how much you are willing to spend and how wealthy you want to appear and how boring you would be if you had a Geo Metro. This one was easy, let’s talk about some hard questions. What is your job title? Are you indispensable? I love getting promoted as much as the next guy but I learned a lesson many years ago that this again is an outcome that you have little control over – like the buy/sell decision by a Wall St. investor who just got money selling derivatives to a loser and wanted to ‘buy something’ or the investor who got a margin call and had to ‘sell something’. In many companies, the promotions and titles are like that – in good years, we ‘promote people’ and in bad years, we have to ‘trim’. If you let the management decide how you perceive your intrinsic value, you are going to be giddy when you should probably be scared and vice-versa. A much better question is – What value do I add? – and how can I measure it. In fact, job titles and roles are a limiting constraint that you want to break out of. Just because someone calls you a sales engineer doesn’t mean that you can’t build a super cool real world application or actually make a sale or help product team decide the next big thing. Superstars do what excites them, and then titles and rewards follow. I have seen this happen too many times in my 12 years of working life. As Seth Godin says in Linchpin, his latest book – Are you Indispensable? And if not, what’s holding you back – and job title is a really poor excuse. “You weren’t born to be a cog in the giant industrial machine. You were trained to become a cog. “Do not internalize the industrial model. You are not one of the myriad interchangeable pieces, but a unique human being, and if you’ve got something to say, say it, and think well of yourself while you’re learning to say it better. I don’t want to be a cog no matter how amazing the machine is. Do you? Best at Something. Don’t Take That Job or Buy That House: Warren says ‘Charlie and I avoid businesses whose futures we can’t evaluate, no matter how exciting their products may be.’ When evaluating your life choices, don’t do something unless you understand it – better, you grok it. If you lived through the dot-com boom and bought stock in TheGlobe.com and Exodus because your neighbor told you or worse, your neighbor bought it, got rich and tried to hide it from you and then you caught on and bought it!! Then, you probably learned your lesson. For others, the home buying market may have been the teachable moment – as they say it. We are ALL ‘best at something’ – Seth Godin points out that if you narrow your niche enough you can find out that while you may not be the best businessman (Warren took that title) or best Golf player (Tiger took that one and the waitress home) – you can often find that you are probably the best Thai food restaurant south of Market Street or the best tool for building web pages that do only one thing (Postlets). Don’t become dependent on the kindness of strangers: Warren Buffett says – ‘We will never become dependent on the kindness of strangers’. I would add relatives and friends too. And for businesses these days, you can barely rely on bankers leave alone strangers. This means be a thoughtful spender (I didn’t say frugal), invest if you can and make lots and lots of trusted relationships where you give. Strangers, distant relatives and surface-level friends may not be there for you when you need them but people that you were good to will often be there. That’s enough food for thought for a day’s blog post. The Warren Buffett letter and Seth Godin’s book have 100s of such insights if you look for them and have the right attitude towards it. Try it, and let me know what you think. Partner, Storm Ventures. Previously VP of product management & strategy at salesforce.com across applications and platform. Previously founded and led Oracle SaaS Platform, and held engineering and product management roles in SOA and Identity Management. Anshu has a B. Tech. (Honors) and M.S. in Computer Science from Indian Institute of Technology at Kharagpur and University of North Carolina at Chapel Hill respectively. Read his blog here.